Commercial cleaning, janitorial services and maintenance services in Northern Illinois and Southern Wisconsin. At Peterson Cleaning, Inc. we guarantee quality, reliability, and professionalism at affordable prices for every one of our customers. We provide janitorial services, maintenance services and contract commercial cleaning for a variety of building types including office complexes, industrial buildings, medical offices, colleges, schools and retail stores. We are licensed and insured for your protection. 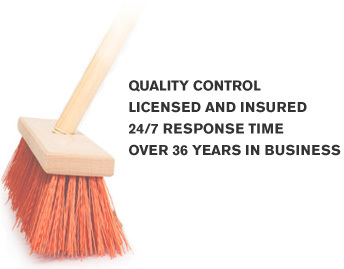 Peterson's system pairs an expert Cleaning Supervisor with highly trained crew members. We guarantee quality, reliability, and professionalism. We are available 24/7 service to insure you get the best service. Our Cleaning Supervisors and Night Operations Staff ensure top quality work each night, then our Management Team conducts regularly scheduled daytime inspections where we give and receive feedback from our customers. This two tier approach ensures that specifications are met and our customers remain satisfied.